How a comet’s dust tail forms bands stretching millions of kilometres across the sky has been observed for the first time by UCL scientists. The study, published today in Icarus, reveals the charged nature of the dust particles and the important role of the Sun in forming the characteristic patterns. An international team led by researchers from UCL Mullard Space Science Laboratory (UCL MSSL) successfully mapped the movement of dust particles in Comet C/2006 P1 McNaught, one of the brightest comets visible from Earth in the past 50 years. They used images collected from two NASA spacecraft – STEREO and SOHO – to track the behaviour of individual dust particles, which are about the same size as those found in cigarette smoke. Their findings indicate that the striations form when dust grains released from the comet’s head break up into smaller particles, forming long bands. The smallest grains in the neat bands can later be moved around by the solar wind, changing the tilt of parts of the bands. “Understanding how dust behaves in the tail — how it fragments and clumps together — has important implications for understanding similar processes that formed dust into asteroids, moons and even planets billions of years ago,” explained first author, PhD student Oliver Price (UCL MSSL). Comets are cosmic crumbs of frozen gas, rock and dust left over from the formation of our solar system 4.6 billion years ago — and so they may contain important clues about our solar system’s early history. Those clues are unlocked as if from a time capsule when a comet’s elliptical orbit brings it close to the Sun. Intense heat vaporizes the frozen gases and releases the dust within, which streams behind the comet, forming two distinct tails: a plasma tail carried by the solar wind — the constant flow of charged particles from the Sun’s atmosphere — and a dust tail. 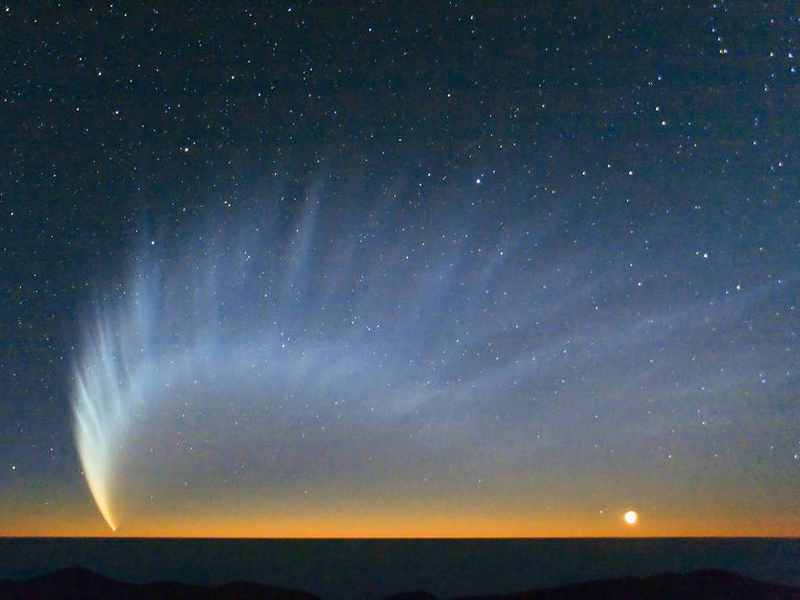 The team studied images of one of the biggest and most structurally complex comets in recent history, Comet C/2006 P1 McNaught, over a two-week period in 2007. They prepared a video simulation by compiling data mapping the location of each tiny speck of dust along with its physical characteristics and solar conditions at the time. The team focused on a phenomenon that had previously eluded scientists – why the banded patterns in comet tails form, and also discovered clear evidence of another phenomenon: the fact that these patterns are sometimes disrupted. The rift seemed to be located at the heliospheric current sheet, a boundary where the magnetic orientation, or polarity, of the charged solar wind changes direction. Scientists have long known that a comet’s plasma tail is affected by the solar wind but they expected its visible dust tail to be unaffected by any electromagnetic changes nearby. It was difficult to tell exactly what was going on, and where, because at roughly 100 kilometres per second, McNaught was rapidly traveling in and out of STEREO and SOHO’s view. The simulation allowed the team to study McNaught in detail, revealing dust particles being jolted out of position as the comet crossed the current sheet, breaking up each striation’s smooth, distinct lines. Scientists have long known the solar wind affects charged dust; missions like Galileo and Cassini watched it move electrically charged dust through the space near Jupiter and Saturn but it was a surprise to see the solar wind affecting larger and heavier dust particles in McNaught’s tail. “Now that we see the solar wind changed the position of dust grains in McNaught’s tail, we can ask: Could it have been the case that early on in the solar system’s history, the solar wind played a role in organizing ancient dust as well?” Professor Jones concluded. The first observations of striations forming have revealed new insights on the Sun’s effect on comet dust tails.